Research Symposium, Birkbeck/Goldsmiths’ Art Department, University of London and The Field, New Cross. Research Symposium organized by Claudia Firth (Cultural and Critical Studies, Birkbeck) and Achim Lengerer (Art Depart­ment, Goldsmiths) in collaboration with Kristien Van den Brande (Art Department, Goldsmiths), Cristina Ribas (Art Department, Goldsmiths) and Vera Weghmann (Centre for the Study of Social and Global Justice, Nottingham University). The events will take place at both Goldsmiths’ Art Department and Birkbeck, with an informal workshop session to be hosted at The Field, an alternative community space in New Cross. Taking Peter Weiss’ historical novel The Aesthetics of Resistance as a loose starting point, the symposium will take a sideways glance at questions of how we might ‘read’ leftist historical narratives. While deferring an interrogation of the term resistance to a later point in time (and a further symposium in October at Birkbeck), we will follow a thread of collective learning and sharing knowledge and ask how subjectivity and politics might intersect through the process of ‘reading’ together. One of our questions will be: how are these processes of collective ‘reading‘ organised and what can we draw from this collective experience for a contemporary artistic-activist praxis. Events will include: debates on the crossovers between work; education and workers’ education from a historical and a contemporary perspective; the reading group as cultural, social and historical form in relation to The Aesthetics of Resistance; the historical essay as exhibition and films by Peter Weiss; reading groups as a practice outside or at the margins of institutions; the interrelations between collective reading and political praxis. Keynes Library, 43 Gordon Sq. An evening panel on the changing nature of work, education and workers’ education. The shift to Post Fordist modes of production and cultural and immaterial labour have changed our relationship to knowledge and how it is produced as well as changing the nature of work itself. With the increasing presence of work in education (for example through ‘employability’ training and work placements) it seems pertinent to ask questions regarding the relationship between work and education and the organisation of higher education itself. How have these relationships changed? Are there models from the past that could be mobilised now? What might alternative models of organization have to offer? Birkbeck College itself comes from a history of Mechanics Institutes in the UK originally formed in the 19th century to provide adult education to working people and seems the perfect setting in which to ask some of these questions. Stevphen Shukaitis, lecturer at Essex University. His work includes writings on Autonomia, self-organisation, class (re)composition and cultural labour. Mike Neary from the Social Science Centre, Lincoln, who currently provide free co-operative higher education. The SSC is run as a not-for-profit co-operative, and organised on the basis of democratic, non-hierarchical principles. Richard Clarke, until 2012, was Senior Lecturer in Conservation at Birkbeck College and Director of the University of London Centre for European Protected Area Research. 10 am Claudia Firth and Achim Lengerer. In Collective Reading as Political Act? Firth and Lengerer will introduce their shared research of various Aesthetics of Resistance reading groups in East and West Germany during the 1970s/1980s. They will explore the reading group as a social, cultural and semi-public form, what it means to read and learn collectively and what this might mean for critical knowledge production and subjectivity. 11:30 am – 1 pm Carles Guerra. 1979: a Monument to Radical Instants is the title of an exhibition Guerra curated in Barcelona in 2011 inspired by The Aesthetics of Resistance and Foucault’s lectures on biopolitics. The exhibition was conceived as a kind of historical essay that operated through image and object to organise the temporal moment as monument. Choosing 1979, Guerra focussed the exhibition on a pivotal year for Spain and one that could be characterised as epitomising the birth of neoliberalism. 2 – 4 pm Open conversation with protagonists of different reading groups: the New Cross Commoners, The Litany Reading Group (Nicola Guy, Katherine Jackson, Louisa Lee, Sophie Risner and Amy Tobin), and Katie Hare and Andrea Williamson, who are part of a group of 12 MFA candidates at Goldsmiths that are meeting on the self-selected theme of love and politics. These three self-organised reading groups will share their experiences as groups that have read together and reflect on the interrelations between reading and their particular social and political practices. The session is co-hosted by Kristien Van den Brande whose experience with reading groups range from memorising books by heart, durational collective readings and self-organised recurrent reading sessions in and outside of academia. 4 – 6 pm Screening and lecture by Florian Wüst. This thinking in oppositions: Peter Weiss and the political self of the artist. Looking at the period in which Peter Weiss shifted from film to theatre in the early 1960s, Florian Wüst elaborates on Weiss’s growing efforts to examine the social, political and economic realities surrounding him. How to learn from the follies of history through art? How to activate societal change without dismissing intellectual critique and freedom? The screening will be followed by a conversation with Edgar Schmitz (Art,Goldsmiths). This will be a practical workshop session in which participants are asked to bring fragments from their experiences of the previous two days’ events. These could be words, things, dates, feelings or anything they might have taken away with them. Together, we will ‘read’ these fragments using a variety of methods and perspectives. Starting with discursive modes towards more affective registers to include the body, voice, rhythms and dynamics. This will be in collaboration with Cristina Ribas who proposes the title Protocol to intersect vocabularies for her intervention. The symposium finishes with an invitation to join us and the New Cross Commoners at the People’s Kitchen at the Field for a communal meal. 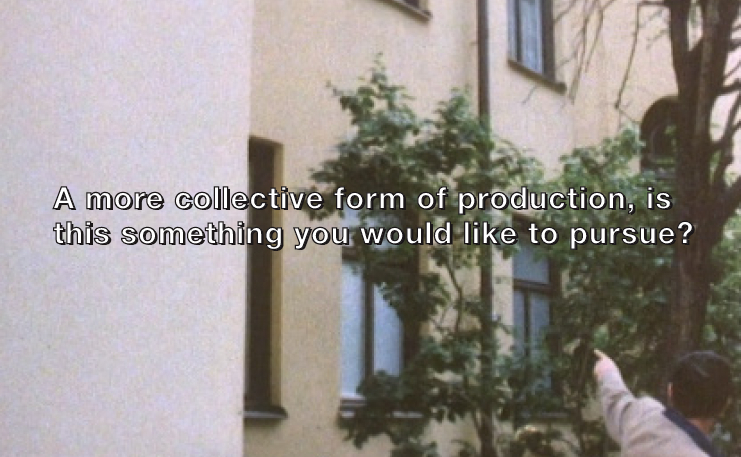 * The title refers to Paulo Freire as well as to Harun Farocki’s film On Display: Peter Weiss (Zur Ansicht: Peter Weiss), 1981. The image on the poster collages a subtitle as well as fragments of a still image from Farocki’s film.